A month ago, reflecting on managing arthritis when traveling, https://nowheelchair.wordpress.com/2011/12/19/pain-free-flying/, I promised more hints for healthy travel. Here they are. Overnight flights: these are the killers for a bad back, especially when you really do need that sleep to begin your first day functioning. 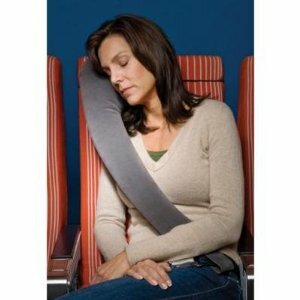 I can usually sleep with the help of a sleep aid, a neck pillow and a pillow for lumbar support. You can buy these on line at Amazon. I haven’t actually tried the one pictured, but will probably get it for my next big adventure mid February. My granddaughter and I are off to Nicaragua with a group from Saint Mark’s Episcopal Cathedral. This is an all day trip and I chose a two stop itinerary. You probably think I’m crazy. I have found that shorter hops and getting up to change plans, actually helps maintain back health. It is long flights that put the lower back at greatest risk. We will probably be at the airport and through the check in and security screening with plenty of time to spare. While waiting for my flight, I often lie on the floor in an out-of-the way spot and do some simple Feldenkrais and Pilates moves to line everything up before boarding. Alicia will probably be totally embarrassed at her grandmother’s bizarre behavior. It is easy to make a 13 yr. old uncomfortable! Once we arrive at our hotel, I will do some simple stretches, mostly lying flat on my back before getting into bed. Take the bed covering and lay it on the floor as a mat to protect yourself from the myriad leavings of many previous shoes and bare fee. In the morning, find a chair without arms or the corner of the bed to sit on and do a series of sitting stretches. I use Jennifer Kreis’s Hot Body, Cool Mind sitting series designed to wake up every joint and gently stretch every muscle. I have been using this DVD and this particular segment for so many years that I have the moves memorized. I think my immune system is greatly supported by the lymphatic thumping at the head, neck, inner elbow and underarms, chest, stomach and groin, then down the spine. The same DVD has a standing chi gong segment, plus a Pilates routine (too rigorous for most of us dealing with spinal issues), a simple yoga routine I love following, and several other segments. You certainly get your money’s worth when you buy this DVD. My grandchildren think this little routine of mine at the corner of the bed is hilarious and they have teased me about it months after our trips together. By the way if you are interested in the pictures from these trips, go to www.betsystrips.shutterfly.com. Enjoy. For those overnight flights getting to your destination between 6 and 9 in the morning, the best antidote to jet lag is outdoor walking. Arriving in Ireland with May, and in Scotland with Danny and Carsten, we set out walking the town, the countryside, the castle grounds (save serious tourist investigation for later when you are rested). Keep moving. Stop for a snack when needed. Tea helps. When you check in to your hotel, maybe 30 minutes flat, but avoid a deep sleep. Walk to a place for supper and then go to bed. You will wake up remarkably rested and in tune with the new time zone. Once traveling to India, I walked my legs off all day long in Bombay, now Mumbai. There was no where to sit down, the parks occupied by homeless. I knocked on the door of a church and asked if I could sit for a little while. A little later I joined at lot of office workers in a cafeteria style restaurant, sitting at a long table and listening to their chatter. I’ve never felt unsafe. People are nice the world over. As someone said, there are only 10 bad people in the world; they just move around a lot. I carry a back pack instead of a purse. This was recommended to me by my chiropractor years ago. I know it’s hard to fashionable, but they make some really cute back packs these days. When traveling, keep your eyes wide open and aware at all times, and pull that pack around in front to hug next to your chest at the slightest hint of crowded conditions or motor scooters approaching too close. Never leave it hanging on the back of a chair. Rick Steves, Europe Through the Back Door, is a travel guru and his store in Edmonds, WA (and on line) sells the most comfortable money belts ever made. The material handles sweaty Latin American, Asian and African climates and there is a plastic lining to keep your documents and money from getting wet from your dripping sweat. I just heard a story yesterday at our Nicaragua orientation about a woman whose back pack with her money in an outside pocket was on top of the bus transporting them to their next home stay. A sudden down pour soaked her pack and her money was ruined. USA dollars with a black bleed from a notebook making every bill’s denomination indistinguishable. Keep your money in your money belt inside the plastic liner. Put in on with your underpants every morning. 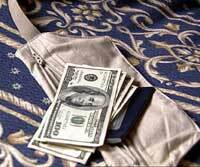 Loose change for the day’s expense can live in your pants pocket in a small purse. Personally, I think the stress of travel can increase your arthritis twinges. The money belt wearing practice and the back pack for your sun screen, water bottle, camera, notebook and guide book, can smooth out your day and reduce stress. Keep your pain-reducing supplements or medicines for the day, plus your supplements for the next meal and a couple meal bars or snack bars in the back pack as well. One last tip: when walking, a brisk pace will keep your back healthier. The museum walk is lethal. I remind myself to pull up the pelvic floor while staring at a painting or waiting in line, a kegel exercise. Straighten your shoulders and let your skeleton drop from the base of the skull. You will fatigue much more slowly. Take tea breaks to rest. If it gets too bad, hang upside down. 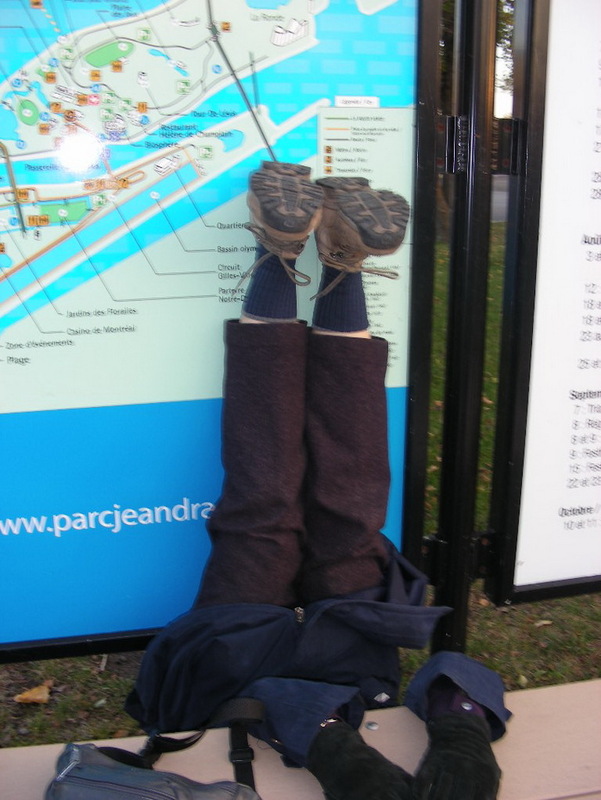 Here I am doing that in Montreal. My grandson hid when some other tourist came by. Ah, youth. They will have arthritis someday and perhaps he’ll remember his silly grandma. This entry was posted in Arthritis, Health and Fitness, travel and tagged arthritis, back pain, chiropractic, feldenkrais, India, Ireland, money belt, Mumbai, Nicaragua, osteoarthritis, over night plane trips, pain, pilates, plane travel, Rick Steves, Scotland, spinal stenosis, travel hints, travel pillow, travel safety by nowheelchair (now blogging as an author at www.MyLifeAsFiction.com. Bookmark the permalink.